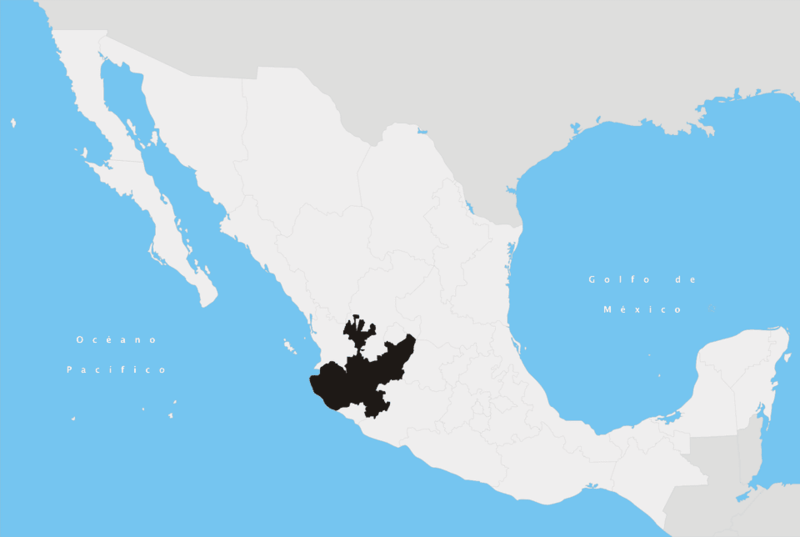 The Mexican state of Jalisco is located in northwestern Mexico. This state is famous as the birthplace of mariachi, tequila and Mexico's national sport, charreria (Mexican rodeo). It's home to the second largest city in the country, Guadalajara, as well as one of the best-loved beach destinations, Puerto Vallarta. Here are some other important things you should know about this most Mexican of states. Topography: dominated by three of Mexico's biggest mountain ranges - the Sierra Madre Occidental, the Sierra Madre del Sur and a volcanic range that stretches east-west creating gorges, canyons and plateaus. The highest peak is Nevado de Colima (14,600 feet above sea level) on the state border to Colima. Major Festivals: the mariachi festival in Guadalajara is held yearly at the end of August/beginning of September. The state capital Guadalajara is a modern metropolis that enjoys a cultural heritage rich in history, customs and beautiful architecture. The city's original 17th-century cathedral was destroyed by an earthquake and rebuilt in impressive gothic style in the mid-19th century. It is surrounded by four pleasant plazas, arranged in the shape of a cross. The Government Palace with a striking stone facade was witness to an important historical event – the attempted assassination of then president Benito Juarez in 1858. The many well-preserved churches from the Vice Royal era, as well as numerous theatres and museums, a colourful, bustling market below Plaza Guadalajara and a vivid nightlife, definitely keep the visitor busy. In the evening, a visit to the Plaza de los Mariachis and listening to their music is a must. A great way to get to know the main sights and monuments is by taking a walking tour of Guadalajara. Jalisco is, among four Mexican states, the birthplace of the traditional Mariachi ​musical band, with their tight-fitting costumes with silver trim and buttons, originating in the 18th century. One of the state's foremost attractions is the region around the small town of Tequila where the cultivation of the blue agave paints the valleys in blue and where Mexico's most famous beverage is made: tequila. Take the Tequila Express, a unique passenger train, from Guadalajara and visit the former San José del Refugio Hacienda in Amatitán, known for producing one of the best tequilas. Watch the jimadores (farmers who harvest the blue agave) and the whole process of making tequila and, of course, try some of Jalisco’s "white gold"! To the west of Guadalajara, near the small town of Teuchitlán, the pre-hispanic site of Los Guachimontones covers 47 acres and includes 10 pyramids. This culture began to develop around BC 1000, reaching its peak in AD 200 and its decline in AD 500. Mexico's largest natural lake, the Lago de Chapala south of Guadalajara, and its picturesque towns is a most charming encounter with nature's best. A boat trip on the lake or a tram ride through the town of Chapala with eye-catching buildings that evoke a sense of the belle époque from the late 19th and early 20th centuries, when this was the preferred summer getaway for the wealthy from Guadalajara, is a most pleasant thing to do. They say that the lake emits sodium bromide, and that is why everyone in the region is so relaxed and well-rested. The southern part of Jalisco around the charming towns of Mazamitla, Tapalpa and Ciudad Guzmán offers panoramic views and waterfalls hidden among the hills that can be explored on a thrilling hike or a horse’s back. Bathed in sunshine almost every day of the year, Puerto Vallarta is home to abundant flora and fauna and a pristine coastline that stretches along Banderas Bay, the largest bay in the country. Once a remote fisherman’s village, it has flourished into a cosmopolitan city, equipped with an international airport, marina cruise terminal, golf courses, exclusive resorts, shopping malls, first class restaurants and a wide range of nightlife options. Jalisco's coast combines a landscape full of secluded havens with all the luxuries the visitor needs to relax and unwind. The Costalegre begins south at the Colima state border and stretches more than 186 miles north to Puerto Vallarta. The Bahias of Navidad, Tenacatita and Chamela as well as the Costa Careyes and Costa Majahuas are places where the blue ocean is framed by lush green mountains and mangrove swamps, places that draw the visitor back time and time again. There are international airports in Guadalajara (GDL) and Puerto Vallarta (PVR), and excellent bus connections throughout the state.